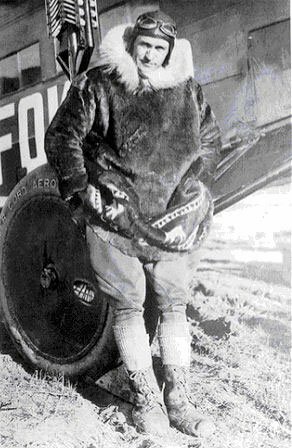 Carl Ben Eielson dressed for cold weather flight. Ed. Note — Carl Ben Eielson was one of Alaska’s most famous pioneer bush pilots. He had many OUTSTANDING FLIGHTS, one of which was making Alaska’s very first air mail test flight on February 21, 1924. 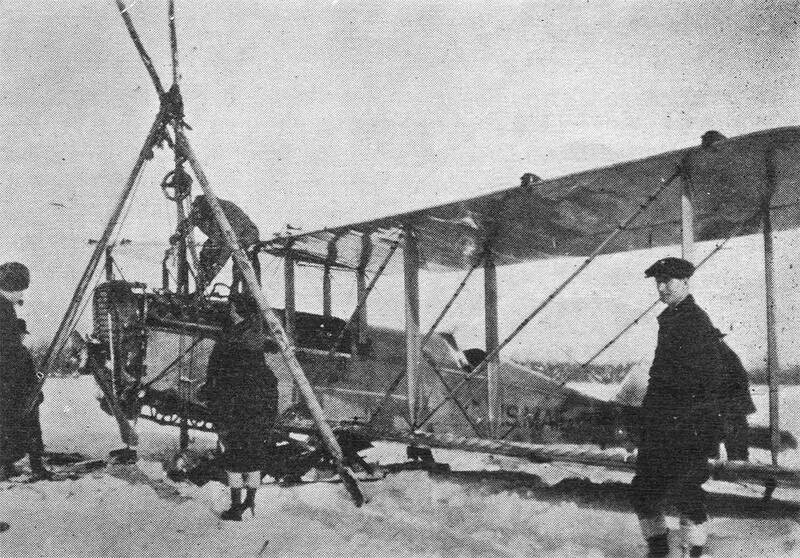 It was a 280 air mile winter flight from Fairbanks to McGrath in a DeHaviland DH-4 open cockpit biplane over very hostile territory. It was completed successfully in just a few hours. (By dog team, in winter, this route averaged 18 days to complete.) On Eielson’s return flight, however, a few problems surfaced as he relates in the following article. Eielson was born in Hatton, North Dakota in 1897 and learned to fly during World War I. After discharge from the U. S. Army Air Service in 1919 he enrolled in law school but alternated his studies with barnstorming tours in the Midwest to satisfy his interest and love of flying. In 1922 he accepted a position teaching at a high school in Fairbanks, Alaska, but soon devoted his future to flying full time for a company that delivered supplies and passengers to mining camps and settlements around Alaska. He was a key figure in promoting aviation, always advancing the many advantages airplanes offered to even the remotest community in the territory. He was also involved with Australian explorer Sir Hubert Wilkins in 1926, 1927 and 1928 in Arctic exploration. Their 1928 flight from the North Slope of Alaska, over the North Pole, to Spitsbergen Island, Greenland, in a Wright J-5 powered Lockheed Vega, a 20 hour flight of 2200 miles, won them international fame. Later that year Eielson accompanied Wilkins on an Antarctic expedition to the South Pole making them the first to fly over both poles within the same year. President Herbert Hoover awarded the Harmon Trophy to Eielson for these polar flights. In October 1929 the trading ship Nanuk operating from Alaska across the Bering Strait was trapped in the ice off the Siberian coast with passengers and a million dollars in furs. 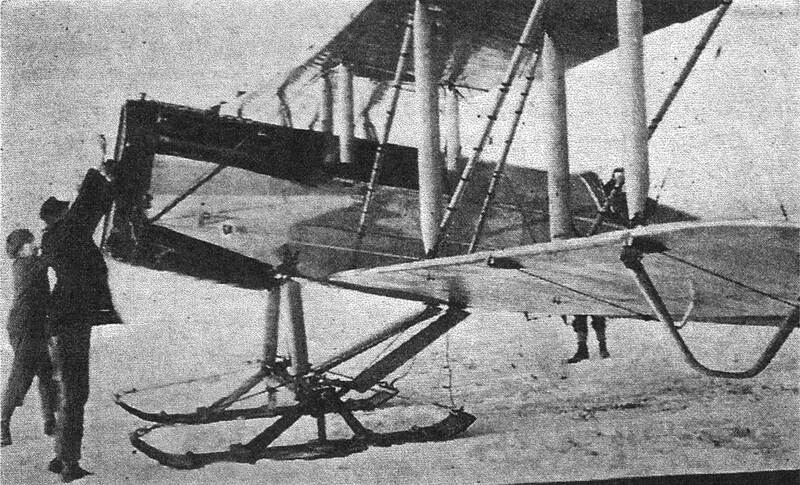 Attempts to rescue the passengers and save the cargo was stymied by extremely bad weather for days on end, but when operations were initiated even though foggy conditions still existed, Eielson accompanied with a mechanic in a Hamilton single engine all metal monoplane, failed to reach their destination. It was three months before the wreckage was found. It took several days more to find the bodies buried deep in the snow. Alaska had lost one of their greatest bush pilots. The following article by Carl Ben Eielson in making Alaska’s first air mail delivery flight appeared in the April 14, 1924 issue of AVIATION. The Air Mail Service recently instituted an experimental air mail route between Fairbanks and McGrath, Alaska, an airline distance of 280 miles, for the purpose of accelerating mail delivery. By dog team-the only conveyance which can be used in the winter months-the length of the route is 371 miles, and it takes on the average eighteen days to cover this distance. On the Nenana-Iditarod route the dog teams for years have made weekly trips, a team leaving each terminus every seven days, carrying 800 lb. of mail each way with 100 lb. additional in food, equipment, and feed for the hungry huskies. The pay is $1,022 a round trip, which consumes about thirty-five days. The first Air Mail test flight was made Feb. 21, 1924, by Pilot C. B. Eielson with 160 lb. of mail. Leaving Fairbanks at 9:00 a. m. the plane arrived at McGrath 11:50 the same morning and began the return trip at 2 :45 p. m. Due to a forced landing it did not reach Fairbanks until 6:40 p.m. The second trip was made on March 1 with the temperature at 8 deg. below zero. The flying time, with 250 lb. of mail, was 3 hr. 15 min. to McGrath and the return to Fairbanks was made, with 150 lb., in 4 hr. 19 min. A considerable contrast to the eighteen days each way required for the dog sledge! On the third trip the flying time to McGrath was cut ta 2 hr. 55 min. and on the return trip to 3 hr. 40 min. So interesting was the report of Eielson’ s adventure that the Postmaster General read it at a recent Cabinet meeting and President Coolidge, impressed by the tale, wrote a personal letter to the Air Mail pilot congratulating him upon the successful completion of his flight. Accompanying this letter went one from Mr. New of similar purport. A thrilling narrative of these experimental flights is contained in a report by Pilot Eielson to Cal. Paul Henderson, Second Assistant Postmaster General, in charge of Air Mail Service, which is reproduced below. – Editor, AVIATION. Air mail in Alaska — Mail DH fitted with skis on the frozen surface of the Tanana river, Nenana, Alaska, March 12, 1924 during a flight from Fairbanks to McGrath. Owing to delay in the construction of our hangar, caused by extreme cold weather, we were unable to move the De Haviland into the building until Feb. 16. On Feb. 20, we completed setting up the machine. The next morning I started on my first trip. Our landing field, which is 1200 ft. long and 600 ft. wide and surrounded by low scrubby trees, was covered with from two to three feet of snow. The snow up here is of a very light, dry, powdery variety. It does not pack well, as is the case in the States, because there is so little moisture in it. The skis on the airplane dug about a foot and a half into the snow, thus making it impossible to taxi except by using about 1300 r.p.m. I find that the wide skis are more practical for this country. The thermometer registered 5 deg. below zero at the start of the first trip. There was no wind. The sky was about two-thirds overcast with clouds, which lay at an elevation of 4500 ft. I carried 164 lb. of mail, a full set of tools, a mountain sheep sleeping bag, ten days provisions, 5 gal. oil (Mobile B), snow shoes, a gun, an axe, and some repairs. My clothing consisted of two pairs heavy woolen hose, a pair of caribou socks, a pair of moccasins reaching over the knees, one suit heavy underwear, a pair of khaki. breeches, a pair of heavy trousers of Hudson Bay duffle over that, a heavy shirt, a sweater, a marten skin cap, goggles, and over that a loose reindeer skin parka, which had a hood on it with wolverine skin around it. Wolverine skin is fine around the face because it does not frost. On my hands I wore a pair of light woolen gloves and a heavy fur mitt over that. I found I had too much clothing on even when I had the exhaust heater turned off. At five below zero I was too warm. I could fly in forty below weather in perfect comfort with this outfit and the engine heater. On my second trip I cut out the caribou socks, the duffle trousers, and the heavy fur mittens and was entirely comfortable. May I not suggest to the Department that all mail pilots be supplied with reindeer skin parkas and large size moccasins. I have worn the fur jumpers that are in use outside and it is my opinion that they are not to be compared with the parkas. This is the consensus of opinion among the old timers here, who have tried everything to ward off the cold. The parkas are knee length, they are very light, they pull over the neck so no wind can blow in through the flaps. The following are the advantages of the parkas: (1.) Cost only forty dollars for a good one. (2.) Light and roomy. Do not blind. (3.) Have a hood on them which can be pulled over the head and tied so that only the eyes are exposed. The fur around the hood is wolverine so it does not frost. (4.) Can jump in and out of plane as well with one on as if you did not have it on. (5.) In case of forced landing, pilot could walk as well with it on as off. It is impossible to wear the jumper as it is too heavy for walking. ( 6.) Greatest warmth for its weight. 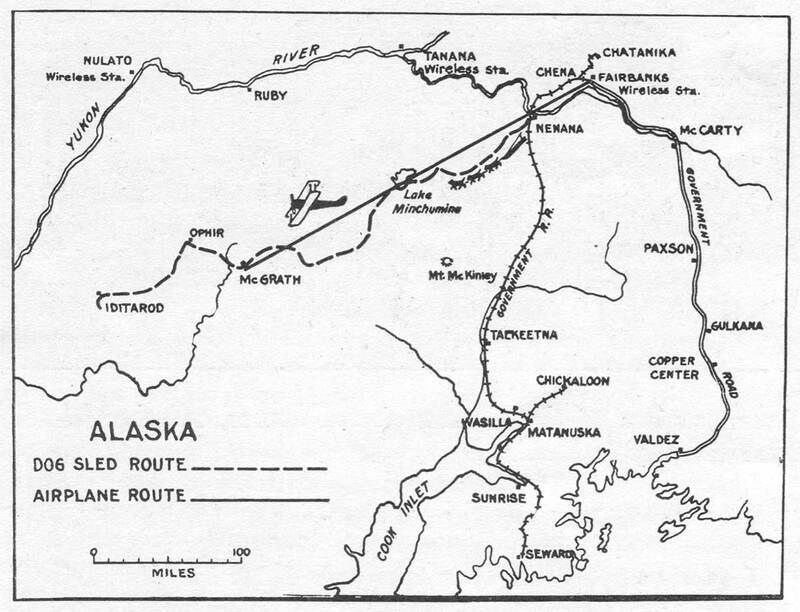 Sketch map showing the experimental air mail route and the dog sled route from Fairbanks to McGrath, Alaska. The moccasins are advantageous because they are light, warm and comfortable. As many pairs of stockings as necessary can be put on. The rudder can be felt all the time, thus giving better control. I took off the field on Feb. 21 at 8 :45 a. m. The skis dug into the snow until I got up a little speed, then gradually lifted out. I ran 800 ft. before I left the snow. I turned the motor to 1450 r.p.m. until off the ground. I then cut it to 1300. I turned the motor from 1250 to 1350 on the trip. The motor never missed coming or going. The tachometer did not work steadily, but the engine was perfect. My air speed indicator did not work at all and my compass was off about 40 deg. in some direction on account of magnetism in the engine. Both of these I have since corrected. As I am well acquainted with the country over which I am flying, I did not depend on my compass except to follow relative readings taken by pointing the plane at landmarks which I knew. After testing the motor and balance, I hit my course. The first 50 mi. I followed the Tanana River, which is a fair emergency field though the ice is a little rough in places. 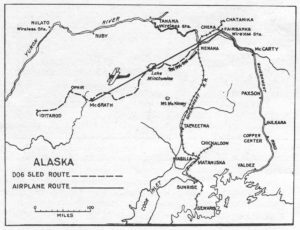 At Nenana, a town of about one hundred inhabitants, I left Tanana and steered across the country. I veered to the left of a straight course in order to follow the flat country and stay near the road houses, which are located on the mail trail at intervals of about 35 mi. After about an hour and a half I spotted Lake Minchumina to my right. I was then halfway between the lake and Mt. McKinley, each of them probably 30 mi. away. I passed to the left of the Munsatli Mountains and a little later saw the main Kuskokwim River, which I followed in to McGrath, my destination. I landed on the Tacotna River at McGrath at 11:35. It took me 2 hr. 50 min. to cover the 260 mi., straight course, and I had a slight favorable breeze. The way I had come I had covered about 315 mi. There was about a foot of snow on the River; an excellent landing field. I came down smoothly, sliding about 500 ft. after the skis first touched the snow. As I had plenty of room, I intentionally made a fast landing. The air mail in Alaska — Close up view of ski landing gear of the mail DH plane piloted by C.B. Eielson between Fairbanks and McGrath. The mail was transferred to a dog team, the gas tank was filled with the same kind of gasoline (Domestic Aviation Gasoline – about 62 deg. B test), 3 gal. of Mobile B was added to what was left in the tank. (I cannot change oil over there as there is no Mobile B there). The thrust bearing was filled with oil, clearances checked and engine inspected. Then had lunch, loaded on 60 lb. of mail (which was all they had) and started the motor. I had no experienced help whatsoever as no one over here had ever seen a plane. It was difficult to start the Liberty all alone. I got a man to hold my hand while I swung the propeller; no one being in the cockpit. It will be easier from now on as I am instructing a helper at McGrath. I left McGrath at 2:35 p.m. – that was the earliest I could get ready on first trip. I knew this was pretty late as darkness descends early here in February. I did not want to stay over as the day was good and I thought it might be very difficult to start the motor after it stood out all night in the cold and it would be hard on the motor. As there was no wind I thought I could get back in better time by flying a little faster and taking a straighter course. I expected to get home by 5:10 p.m. – that is just at dusk. I flew over Appel Mountain and 1 hr. 15 min. later I reached Lake Minchumina, which is nearly the halfway point. Later I passed over a stream which was not on my map, and I thought it must be the Kantishna River. Later I reached the Kantishna River and I thought it was the Tanana River as it was time for me to be nearing Nenana. To the left I saw a bluff that looked like the Nenana bluff; I checked it further by noticing a river going around the bluff, but I was positive that it was Nenana when I saw a river entering the Tanana at the point where the Nenana River enters the Tanana at the town of Nenana. I struck for the bluff, and everything was all right excepting that the town of Nenana was not in its place. I knew I must have veered to the left so I started up the Tanana to find Nenana. I followed it for half an hour (that is 50 mi.). By this time it was pitch dark. I could not believe that I bad got 50 mi. off my course after the same compass course had brought me to Lake Minchumina half way and this was exactly on the course. I could not see the lights of Nenana so I left the river, going East. I thought I must have got on the Kantishma River and that I was following it back to Mt. McKinley as the country looked flat in the pitch darkness. The sky was entirely overcast – not a star showed. U. S. mail plane at Fairbanks, Alaska after first landing there in darkness on return flight from McGrath, February 21, 1924. I wandered about completely lost for most an hour then I knew that the river I bad left was the Tanana. About this time I saw a light so I cut my altitude and went down to it. It must have been a trapper’s cabin near the Chatanika River. I was tempted to set the ship down there and have a nice place to sleep, but I knew I would wreck the ship if I did, so I decided to look around some more. I went back to the big river I had left and when I was following it down I saw a flare in the distance. I bit for it and it turned out to be my home field. There was a light in front of the hangar. I guessed at the extremity of the field and went in. I hit a tree in gliding and broke off one ski. In landing I nosed over and broke my propeller. The trouble was all fixed up in three days and the plane ready to go again. The entire town had been waiting at the field for over an hour. I had been in the air 4 hr. 10 min. on the return trip. I landed at 6:45 p.m. I had been in the air 7 hr. that day, covering a distance farther than from Fairbanks to Siberia, Fairbanks to Point Barrow, or Fairbanks to Juneau. This seems incredible in Alaska, for it takes a month of hardship at this time of the year to go from here to Nome by the fastest route – dog team. The second trip was made March 1. Weather report from McGrath in morning said “Temperature nine below zero, calm, clouds to South.” At Fairbanks the temperature was zero. Time of outward trip, 3 hr. 15 min. Time return trip of 4 hr. 20 min. Poor time on return, due to head wind. Left here at 8:15 a.m. and carried 252 lb. of mail, arrived McGrath 11:30. Left McGrath 12:55 p.m. and carried 154 lb. of mail, arrived here 5:15. Everything worked fine. Flew straight course going over. Veered to left on return to follow flat country. This is the most practical course in case of forced landing. The mail trail cannot be seen for any distance. I saw it only at a few points. The danger of losing the course is small and in case of forced landing I am always within striking distance of a road house. There are quite a few lakes and rivers for emergency landing. The ground is covered with small scrubby trees. On one side is the highest mountain range in North America and on the other a low range. I use 20 gal. of gas per hour at ordinary speed and about 1.25 gal. oil. The skis are excellent for landing, smoother than wheels, but easier to break. The engine exhaust heater keeps the cockpit entirely warm.